Saari TV app: insight & download. Saari TV allows parents and animation enthusiasts around the world to watch the episodes of Saari animation series from their iOs devices, and brings them info about Saari storybooks and upcoming Saari apps. Every two weeks you can watch a new episode completely free. You can also purchase a pack ofepisodes to watch them any time. When you purchase a pack you have the option to download specific episodes to your device’s memory. This way you can enjoy them even without an internet connection. Friendship and respect are the core values of the story, as they learn to share, help each other and express their feelings. Music is an universal language that allows us to communicate regardless the different cultures or origins. 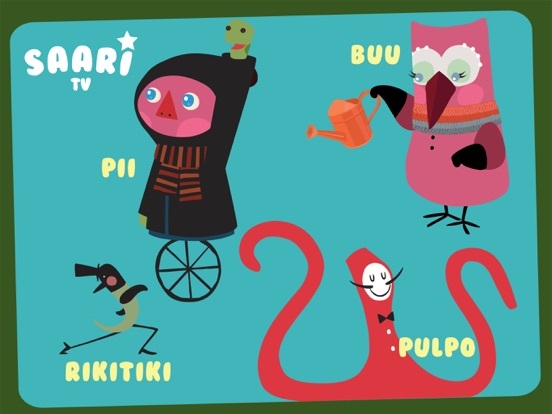 In Saari, each character has its own instrument and melodies. The Saari TV show has 39 episodes of 3 minutes. It has been featured in many international festivals and it was co-directed by Veronica lassenius and her husband Pablo Jordi. A coproduction with TV3 from Catalunya. it features a very nice score from Ivan Llopis from BanjoMusic. Enjoy a new free animation episode every week. 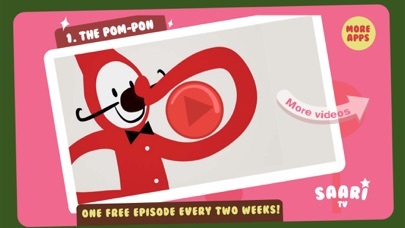 You can also purchase “episode packs” to watch your favourite episodes whenever you want. When you purchase an episode pack you also have the option to download the episodes to your device so that you can watch them even without an internetr connection. If you want to have the whole series, you can download all the episodes in just one purchase, for a good price! 8 June 2018 : Free! 3 April 2014 : Free!